Start fast and finish strong on the heavy-duty shock absorption and legendary support that make the original Superfeet Green their most famous insole. All types of medium and high-volume footwear with removable insoles. Ranging from running shoes to casual footwear to work or hiking boots. Everybody's feet are different, but all can benefit from the support and comfort provided by a Superfeet premium insole. The firm, contoured shape provides comfort soft insoles cannot achieve. Superfeet makes a variety of products designed to fit different shaped feet for different types of activities and sports. No matter what type of activity or sport you engage in, Superfeet has a product for you. When you stand on a Superfeet Premium Insole, you can feel the firmly supportive shape and materials. It's not soft and mushy like other brands... because although soft non-supportive insoles feel good when you first put them in your shoes, in the long run your foot problems don't disappear. Deep Heel Cup - Features the widest and deepest heel cup that offers maximum support and can help with natural shock absorption. Biomechanical Shape - Has the most shape to help stabilise and support the foot, which can help reduce stress on feet, ankles and knees. Organic, Odour-Control Coating - All natural coating that eliminates odour-causing bacteria. Superfeet are the makers of premium insoles ideal for feet with low arches, golf shoes and cleated athletic footwear, mountain biking shoes, and all types of casual and dress shoes. Superfeet actually began back in the mid 70’s, as the Sports Division of a leading Podiatric Laboratory. In 1977 Superfeet became its own company, with the mandate to ‘provide more affordable orthotics to the general public’. Since their beginning almost 30 years ago, Superfeet has been providing premium insoles for different types of feet, for different activities and sports... When you wear a pair of Superfeet you get more than just an insole. It reflects the passion and commitment of everyone at Superfeet to provide you with healthy feet and a better life. 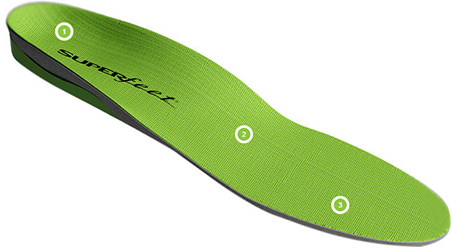 Superfeet Green Insoles is rated 4.5 out of 5 by 62. Rated 5 out of 5 by Garretthegood from Supports from the first steps These insoles are very effective and offer support to the arch in each foot which leads to greater comfort over the duration of any run. I have used them in a marathon and my feet were not a problem. I use them all the time for shorter runs and they are lovely and light. You can feel the support throughout you running, I think they may even help with posture overall, I've hard less lower back pain since using them. Rated 5 out of 5 by Someweirdnickname from GAME CHANGING The size F fits into a Brooks size 10.5 without the need to cut them if you replace them with the Brooks factory insoles. I only had a tiny bit of pain which was barely uncomfortable. I bought these and wow, they improve your running exponentially. I can't express how amazing these things make your feet feel. I never usually write reviews but had to for this product. I'll say it again: GAME CHANGING! Out of the box they look terrible, tacky and you might feel like you've been ripped off. Once you've ran in them though you'll be talking to everyone about them. Rated 5 out of 5 by Bucko76 from Comfortable support After a bad ankle injury and surgery my arch was always sore after a run or even just a long day at work. I now use Superfeet in all my footwear and the difference in comfort and support in my running shoes cover the standard insoles means my ongoing foot pain is almost gone. If you visit the product page of the Superfeet Trim to Fit Green Insoles on our website and select the description tab, there is a full sizing chart listing the Superfeet size label against both UK and European shoes sizes. I have tried Orthaheel insoles before, but they added a lot of weight to the shoes. Are these any lighter? I can confirm these have quite a light construction as the majority of the footbed is made from a lightweight foam structure, with a plastic heel stabilizer. These would not add excess additional weight to the shoes once added. can I get these wet, running through streams and Dartmoor mud, mire and rain? Are they wide enough for Altra's? Has anyone tried these In Altra trainers? I use Altra Torin 2.0 but because of the ultra wide toe box I'm not sure if Superfeet will be wide enough? We would not be able to confirm if these fit into specific footwear brands. However all Superfeet insoles come with a 60 day Comfort Guarantee. If they are not right for you please return them to us within 60 days and we will happily refund them for you. i run 30 plus miles a weak , but suffer from plantar fasciitis and would like to no what colour would suit me best.... tks..
What is the measurement in the thickest side of the insole? Unfortunately this is not a measurement the manufacture provides.